Bazaar's senior fashion market editor Joanna Hillman has impeccable style, and luckily for us she is documenting 30 days of her sartorial picks. Hillman posts a new outfit every day in December...which means a whole month of total outfit envy on my part.Chock full of leopard prints, layers and a signature red lip, this surely doesn't disappoint....totally laid-back, casual, and cool with a hint of rocker glam. I heart it. Now I am off to pack for a trip to my hometown of Chicago. Nothing like mulling over an editor's fab style and then staring blankly into my mediocre closet waiting for inspiration to pounce....siiigh. My pal Em is getting hitched this weekend (12-11-10....how awesome is that?!) and I can't wait for this winter wonderland wedding to take place. It is going to be beyond gorgeous....which reminds me that I desperately need to charge my camera. Toodles! I seriously "aww-ed" out loud while reading the bit about your friend's wedding. 12-11-10?? Too cute! Have an awesome time in Chicago. I'd love to visit there one day! I also love alll of those outfits by Hillman. So much inspiration! 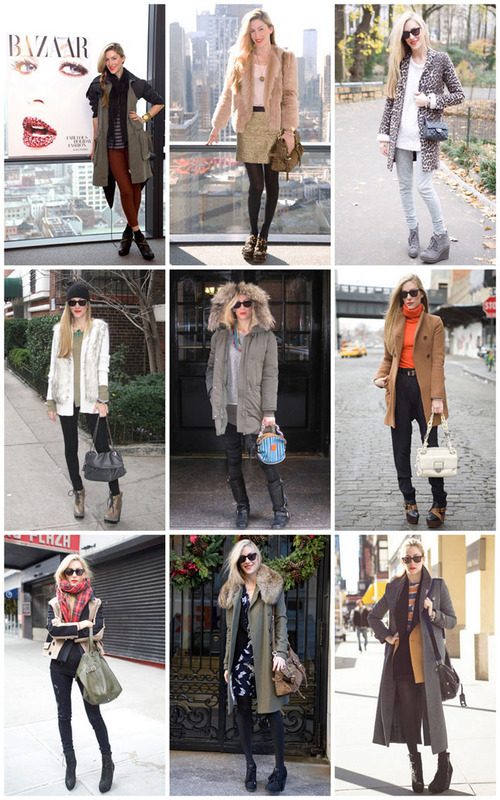 Love these outfits- casual yet pulled together for a great cold time look. You'll need them for chicago- it's cold there. Have a great time in your old stomping ground.